I’m going to give you fair warning: This Strawberries and Cream Overnight Oatmeal is deliciously addictive. I suppose it’s a good thing it’s healthy. It also happens to be gluten-free and naturally sweetened. With the weather getting warmer (finally! ), it’s time to trade my warm bowl of oats for a chilled jar of creamy overnight oats. I am so not mad about it! I was in my glory last week. The weather was perfect for an outdoor coffee session on the deck. It was warm and sunny with a soft breeze. The entire weekend was absolutely beautiful. I spent the better half of the weekend with my hands in dirt, weeding and pruning in preparation for the new green to make its appearance. I’m in desperate need of color! The gray winter palette sucked the life out me. Let’s chat about this Strawberries and Cream Overnight Oatmeal. After all, that is the reason you’re here. This healthy breakfast (or snack) couldn’t be easier to prepare. It starts with a simple strawberry compote comprised of fresh strawberries and a drizzle of maple syrup. Don’t be deterred by the word compote. It’s just another word for jam, only a bit chunkier. The strawberries and maple syrup simmer over medium-low heat just long enough for the strawberries to release their natural sugars and thicken. The process takes about 5 minutes total. Once the compote is ready, it gets added to a large bowl and mixed with the other oatmeal ingredients. I like to divide the oatmeal between individual glass jars for an easy on-the-go breakfast option. They’re great to stick in your lunchbox and can be enjoyed at your desk. The protein-rich ingredient list will keep you full for hours. I like to top my oatmeal with toasted Diamond of California sliced almonds. The toasty crunch of the almonds adds a nice texture to the top of the creamy oatmeal. It’s all about textural balance! Other topping options include: flax or hemp seeds, additional chopped strawberries or a variety of fruit you happen to have on hand, a drizzle of chocolate (my husband’s idea) if you’re in the mood for snacking, or a sprinkle of your favorite granola. The options are endless. Go ahead and get creative! 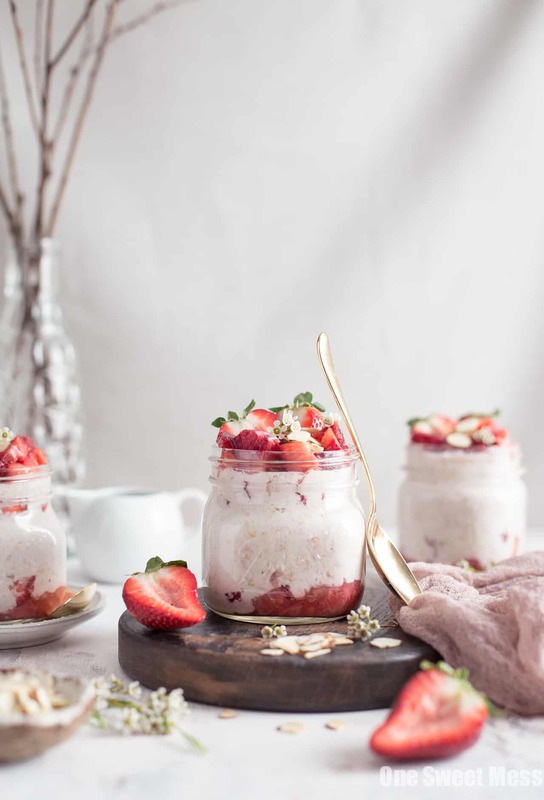 What I love most about this Strawberries and Cream Overnight Oatmeal is the bold strawberry flavor mingled with the creamy vanilla bean. It reminds me of the strawberries and cream instant oatmeal I used to enjoy as a kid but now realize isn’t all that healthy. That’s not the case with this recipe. Everything that goes in to making this oatmeal is good for you, from the protein-rich Greek yogurt to the toasted coconut almond milk. It’s all good! If you’re looking for more overnight oatmeal options, check out my recipe for Apple Pie Overnight Oatmeal or Strawberry Banana Overnight Oats. To make the compote, add strawberries and maple syrup (or honey) to a saucepan. Bring the mixture to a simmer over medium-low heat. Cook, stirring often, until the strawberry mixture thickens, about 5 minutes. Set aside to cool slightly. In a large bowl, add oats, yogurt, milk, vanilla bean paste and extract, maple syrup, and chopped strawberries to a large bowl. Stir to combine. Fold in the strawberry compote. Divide the mixture between 5 glass mason jars. Place the jars in the refrigerator to chill overnight. The jars will stay fresh for up to 7 days in the fridge. Top with toasted almonds, fresh fruit, flax or hemp seeds, and granola before serving. Regular old-fashioned oats can be substituted for gluten-free old-fashioned oats if you’re not following a gluten-free diet. For a vegan option, substitute equal amounts of non-dairy yogurt for Greek yogurt. If you don’t have vanilla bean paste handy, add an extra teaspoon of vanilla extract or the seeds from 1 vanilla bean. If you like this recipe, pin it to Pinterest! Disclosure: This recipe was created in partnership with Harris Teeter. All text and opinions are 100% my own. Thank you for your continued support as I work with brands I love and that make One Sweet Mess possible! A nice dish for my Sunday brunch! thanks! !